Christmas... the decorations, the smell of hot chocolate, fresh snow... In Arc 1950 Le Village, we do our best to bring your childhood memories back to life. Like any family, we decorate the village and the Christmas tree under the clock tower, we listen to the traditional Christmas songs, we write our letter to Santa and, of course, we await his arrival with impatience! Spending Christmas with us means plunging into a magical world, with a great parade, the arrival of Father Christmas, a huge firework display and numerous surprises... Everyone can share this long-awaited celebration in the heart of the Alps, as if they were in a world of their own for the evening. Spending Christmas in Arc 1950 is a unique family experience! And that’s not all: at the same time, the children will see the Post Office airplanes and their pilots whose mission is to take the very last letters to Santa. At 5.30, a special Christmas Marshmallow Party will be held in the centre of Arc 1950 with surprises for the whole family. 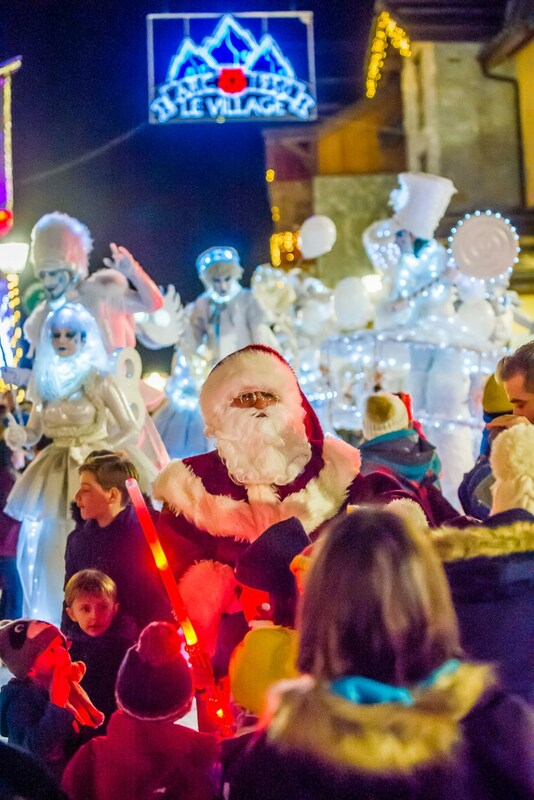 At 6pm, a fabulous parade in the streets and the arrival of the person we’ve all been waiting for… Father Christmas!